Bad Cat Black Cat 15, 1x12" Combo, SOLD! 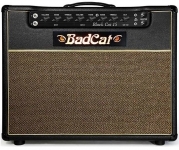 Bad Cat Ltd Edition Classic Deluxe, SOLD! Bad Cat Classic Deluxe K-Master! SOLD! Bad Cat Cub 15R, Head, Showroom Model, SOLD!